ARTICLE LIST follows the lead article this time. ALL NEIGHBORS ARE WELCOME TO ART VISIONING MEETING, THURSDAY, AUGUST 22, 7 p.m.
1 - Neighborhood Public Meeting About Mosaics - Thurs., Aug.22: Help Plan Art Projects That Will Become a Destination! Did you attend the Dunn’s Marsh Neighborhood Picnic early in August? Then you probably met mosaic artist Marcia Yapp, and you already know that she will lead a neighborhood meeting on Thursday, August 22, at 7 p.m., at Prairie UU. Society, 2010 Whenona Drive. · It’s the neighborhood’s chance to tell Marcia what kind of imagery we’d like to see. · It’s our opportunity to arrive at a consensus on what are most important positive characteristics to display to ourselves and the world about our neighborhood. The official ATTACHMENTS will be found in your attachment box after the list of embedded photos. An easier way to see them all at once might be to go to the bottom of this e-mail where they may be displayed consquentially. 3 - Want to Help Pack Backpacks? 27 -Want to Provide Music for an Easy Audience? 31 - Arboretum Native Gardening Conference - Sunday, September 15: 8:45 a.m. - 4:30 p.m.
Do you know any student in the neighborhood, grade 1-12, who needs a backpack and school supplies? Be sure that child gets to the backpack giveaway on Saturday, August 27, in the park between Britta Drive and Britta Parkway, from 4 p. m. until dark. Backpacks with supplies will be appropriate for 3 different grade levels: K-4, 5-8, and high school. At least 200 backpacks full of school supplies will be prepared, and if there aren’t enough to go around, students can leave their names for later delivery. Back to School, Back to Fun, Back to Learning is the theme of the event, and besides the backpacks with school supplies, 2 Schwinn bikes will also be given away. Free refreshments including brats and hot dogs will be part of the festivities. The event is planned by the Britta Drive Dunn’s Marsh Neighborhood Association, a new organization in the neighborhood. Read more about the BDDMNA in article #13. Sponsors of the event include Associated Bank, Boys & Girls Club, BP, Einstein’s Bagels, MG&E, Mt. Zion Baptist Church, Sam’s Club, Second Baptist Church, Walgreen’s, and Walmart. 3 - Want to Help With Backpack Giveaway Event? Packing and giving away 200 or more backpacks with school supplies takes a lot of work. You are invited to help at 3 p.m. in the fellowship hall of Second Baptist Church on Britta Parkway at Whenona Drive. The backpacks full of supplies will be given free to students who need them on Saturday, August 24 in Britta Parkway Park from 4 p.m. until dark. Over 60 people had a great time at the Dunn’s Marsh Neighborhood Picnic at the Marlborough Park shelter on August 2. We ate free hot dogs until they came out of our ears, and quenched our thirst with cold soda. Donna Sarafin’s gas grill kept up with the hot dog demand. The food that families brought to share meant picnic plates were well loaded. Brownies and chocolate cake were among the offerings. Two political representatives showed up - Co. Sup. Dorothy Krause, who represents the Fitchburg part of the neighborhood, came early, while State Assembly Representative Terese Berceau arrived well into the event. Six of the seven DMNA Council members came: President Bob Hague, Treasurer Dorothy Krause (yes, the same Dorothy who is a county supervisor and a Fitchburg alder), and members Jon Holmes who ran the grill, Thea Bach who is responsible for the Little Free Libraries in neighbor hood, Donna Sarafin, and Mary Mullen. A surprise participant was the president of the newly organized neighborhood group, the Britta Drive Dunn’s Marsh Neighborhood Association. Deacon Tony Williams came to make contact with the Dunn’s Marsh Neighborhood Association and let us know of the backpack giveaway set for August 24. We were happy to meet his wife Denise. Read more about the BDDMNA in article #13. Interestingly, the largest number of people came from the Crawford area of the neighborhood - 24. Belmar came in second with 17 people including 2 from the Renaissance development west of Red Arrow Trail. Marlborough, usually the best represented, tailed a little behind with 14. One lone boy came from Allied. Other picnickers included one of the community gardeners from Chalet Gardens with his boys, musician Sherry Birchall, and the mosaic artist Marcia Yapp who will be leading a community meeting on August 22. (See a separate article.) Although 63 peoplel are accounted for on the sign up sheet, there may have been some we missed. Lots of visiting took place, some while we ate, and some while Sherry Birchall and Mary Mullen led the singing while pounding out the rhythm on guitars. One picnicker joked, “Where’s your bus?” implying that the song selection and demeanor of the musicians came out of the hippie days, but he sang along. Eventually it got too dark to see the music. At that point everybody who was still hanging out helped clean up, and in about 20 minutes the place was empty. If you didn’t come, you missed a good time. But there’s always next year. Many thanks to the 6 people who covered the neighborhood with flyers about the August 2 neighborhood picnic. Carriers in Marlborough Heights were Raju Eliganti, Jon Holmes, Thea Bach, and Pam Flim. Kim Zinski and daughters covered Crawford Heights. Mary Somers, Donna Sarafin, and Mary Mullen delivered in Belmar Hills. Unfortunately, we had no one to deliver on Allied Drive. Still, the Dunn’s Marsh Neighborhood e-News does get to some people in the Allied area. Six hundred flyers were printed. A few were posted in Marlborough Park, but over 590 were delivered door-to-door. We could always use more carriers. Hard-copy flyers are generally put out 2 or 3 times a year. The rest of the time, neighborhood news has to get out via the Dunn’s Marsh Neighborhood Association website www.dunnsmarsh.org <http://www.dunnsmarsh.org> , the Dunn’s Marsh Neighborhood Association Facebook page at https://www.facebook.com/pages/Dunns-Marsh-Neighborhood-Association/187654193505 <file://localhost/pages/Dunns-Marsh-Neighborhood-Association/187654193505> (or just search for Dunn’s Marsh Neighborhood Association on Facebook), or the Dunn’s Marsh Neighborhood e-News (contact Mary Mullen at mmullen@chorus.net or 608-298-0843 to get on the list). The Dunn’s Marsh Neighborhood Council acted on serveral fronts at its meeting on August 8. 1. Several motions were passed that related to the Verona Road Project. Three motions related to the project. 1. To communicate with WisDOT (Dept. of Transportation), Strand Associates, and our alder and the alder Arbor Hill in favor of extending the off-road bike path all the way from Seminole Highway to the entrance to Arbor Hills. We have heard that the City of Madison favors this but that there are some impediments to doing so (terrain, things in the way, permissions needed, price, not in budget ) The eastern 200 feet was removed this past week because the contract required that. 2. To communicate with various authorities to try to solve the traffic jams at the Verona Road/Beltline intersection. 3. To work cooperatively with the Allied Dunn’s Marsh Neighborhood Association (ADMNA) and artist Elizabeth Doyle on a mosaic project that will be in the vicinity of the planned roundabout near Allied Drive. Neighborhood children will be participants in this project that will probably get underway in the spring of 2014. The DMNA is sponsoring a neighborhood meeting on August 22 with the mosaic artist Marcia Yapp who will be working with us on mosaics visible in the neighborhood along the Beltline. The Council also set dates of the next Council meeting and the Annual meeting of the Dunn’s Marsh Neighborhood Association. The Council will next meet on September 5, 7 pm, at Prairie UU Society. The Annual meeting will be held at Prairie on Thursday, October 10, 6:45 pm. Having learned of the Britta Drive Dunn’s Marsh Neighborhood Association’s plans to hold a backpack/school supplies giveaway on Saturday, August 24, the Coucil agreed to publicize the event once we could learn more about it. Another motion related to DMNA finances. When the DMNA began in 1973, we had to have 2 signers for each check. The by-laws were changed at some point to require only one signer. While the Council must approve every expenditure, that offers less security than having 2 signers plus Council approval. The Council had a long discussion about finding a way to build more security into the system. Our treasurer will talk to Associated Bank to find out if an additional person can be given read-only access to bank records. There hasn’t been any problem with finances, but a careful organization will have more than one person who can access bank transactions. Our current treasury holds $996.60. We’ve spent $158.58 more than we took in this year. Council members shared additional information. Thea Bach has contacted a Madison Library administrator to ask the Library Board to consider offering library services in our neighborhood. At one time the Bookmobile came to the neighborhood on a weekly basis. Mary Mullen had attended a meeting about the proposed Mountain Bike Park which is planned for 40 acres of County property south of Dunn’s Marsh and north of the Pine Ridge neighborhood that fronts on Co. Hy. PD. She learned that paths will be flagged during the winter, and that while mountain bikers over 16 must pay to use the park, younger users and hikers would be able to use the trails for free. A report of a liquor store proposed for the mall where Auto-Zone is apparently is just a rumor. Lumber Liquidators has a permit for construction in a space in the mall. Most Council meetings result in a number of action items that Council members then carry out between meetings. Any resident may attend, and with Council agreement, may speak to topics under consideration, but only Council members can vote at these meetings. When informational community meetings are set up, sometimes a vote of all present will be authorized. At the annual meeting, all DMNA members may vote whether or not they have been elected to the Council. to do something more than just complain. Here’s the story from an e-mail I received on Saturday, August 3. Although we've seen the cat fairly frequently, it has not been a problem (again) until this morning. Around 7am, we heard our cats literally shrieking while sitting in one of our bedroom windows and saw that they were trying to fight with that same black and white cat through the screen. While we were able to get our cats away from the window without injury, the screen will have to be replaced--the second one damaged by this same cat--at a cost of $25 each. Furthermore, had we not been at home at the time, we very likely would have lost our cats through the damaged window screen which is intolerable. We are not sure of the legalities of live-trapping a domesticated animal, or what we are allowed to do with it once it is trapped, and are awaiting a callback from Animal Control. As an animal lover, I would never harm the cat, but it seems senseless to bring it to the Humane Society where it can be reclaimed and the cycle would start all over again. Instead, I'd like to bring it to a friend's farm that has several barn cats where it would be fed and cared for, but not continue to be a neighborhood nuisance. Best case scenario, however, would be to find this inconsiderate cat owner; remind them of the City ordinances against cats running free and let them know what I intend to do should I trap it. Hopefully, that neighbor would then keep their cat on a leash or inside their home. Your help in finding the stray cat's owner would be greatly appreciated. This same cat visited again early in the morning of August 5, again resulting in a torn-up screen. The photo is from August 18, after the cat knocked a birdbath down. Editor’s note: If you know the owner of the cat, please inform him or her of what might happen if the cat is live-trapped in this neighbor’s yard. In celebration of our amazing, sweet cuddly adult cats, we have a special for you! If you meet your match on Saturday, August 24, at any of the Dane County Humane Society locations, and are a qualified home, you and your adult (over 6 months old) feline friend can go home together for free! There will be extended hours at Adoption Center West (7475 Mineral Point Road #42) and the DCHS Main Shelter, (5132 Voges Road) 10 a.m.-8 p.m. The satellite adoption centers are at the Mounds Pet Food Warehouses: 5352 King James Way, Fitchburg; 8311 University Ave., Middleton; 2120 South Stoughton Road, Madison; 2422 Montan Ave., Sun Prairie; and 1725 Lodge Dr., Janesville. Contact the Adoption Center with any questions at 608-838-0413. A newcomer to our neighborhood has found that she mostly likes it here. But there’s one very disturbing issue: she can’t walk her dog in our neighborhood due to the loose dogs that approach her and her dog. As a result of this unwanted attention from dogs on the loose, she’s started walking in other neighborhoods so she can feel safe. Where is this happening? Sheffield, Lumley, Britta Dr, Danbury, and Whenona. She hasn’t taken her dog to the park yet. Dog owners, please take notice. Any walk around the neighborhood will yield a potpouri of eye-candy. That was the subject line of an e-mail sent to Fitchburg Environmental Engineer Rick Eilerson about noon on August 13. The writer - me - could visualize the marsh becoming a sea of teasel just like the edge of the Beltline in from Whenona Drive to Seminole Highway. Not a pretty scene. So, kind neighbors, if you want to stop this nasty plant from multiplying, do the same with any that you see. See a picture of a teasel on the attachment. Marlborough Community Garden will be having a garden celebration on Saturday September 14th with all our friends and neighbors invited as part of the City-wide CAC Garden Days. Come on out to the garden any time from 11:00 am-4 p.m. There will be many things to do for the whole family. · Garlic workshop: Learn how to grow garlic, and get a free bulb or two to plant. You don’t have to be a Marlborough Park gardener to enjoy the gardener celebration. The fun is provided by Marlborough community gardeners. Dunn’s Marsh residents work in a huge variety of jobs and places. While quite a few of us work or have worked for the State of Wisconsin, Dane County, the City of Madison, in schools, grocery stores, scientific labs, for non-profits, factories, insurance companies, Epic, or a similar information-age business, others are proprietors, manage property, take care of children, or have one-of-a-kind jobs. Still others are University of Wisconsin and Madison College students. Unfortunately, some of us have lost our jobs or could never get one. Wouldn’t it be interesting to know the breadth and depth of a neighborhood’s employment details? I imagine I would be surprised if I knew them all. We have a lot of talent here. I think of this neighborhood as being very modest, not a place for doctors or lawyers or judges. But I’ve been surprised to learn that we have a current judge living here. Another resident is a former judge. I’ve met 2 lawyers and at least one medical doctor who’ve called the Dunn’s Marsh Neighborhood home. Since my knowledge of people’s occupations is limited, I can imagine that many more have careers that require what I’ll call “extreme” education. Just the other day I learned that two Dunn’s Marsh reisidents will have a real one-of-a-kind job. Jason and Kimberly Anderson, the family that has one of the Little Free Libraries in the neighborhood, were recently hired as Operations Managers for Cave of the Mounds National Natural Landmark. Cave of the Mounds is near Blue Mounds. That’s truly an unusual place to work. Now that I’ve thought about this subject, I think I’ll make a point of delving into this subject a little further. Just FYI, I’ve been a high school English teacher and an elementary school teacher; a state employee at the Department of Natural Resources, Department of Administration, Department of Employment Relations, and the Wisconsin Public Service Commission. 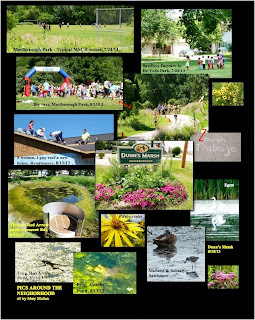 Once I got a grant from the Dane County Cultural Affairs Commission to put together the book In Our Own Words: The Best of the Dunn’s Marsh News. It’s a neighborhood history book. Just so you don’t think I had nothing but white-collar jobs, be aware that when I was a college student I worked summers as a hired hand for my uncle on his dairy farm near Green Bay. There’s a new entity in the neighborhood, the Britta Drive Dunn’s Marsh Neighborhood Association (BDDMNA). It’s a lively group that established itself this spring. 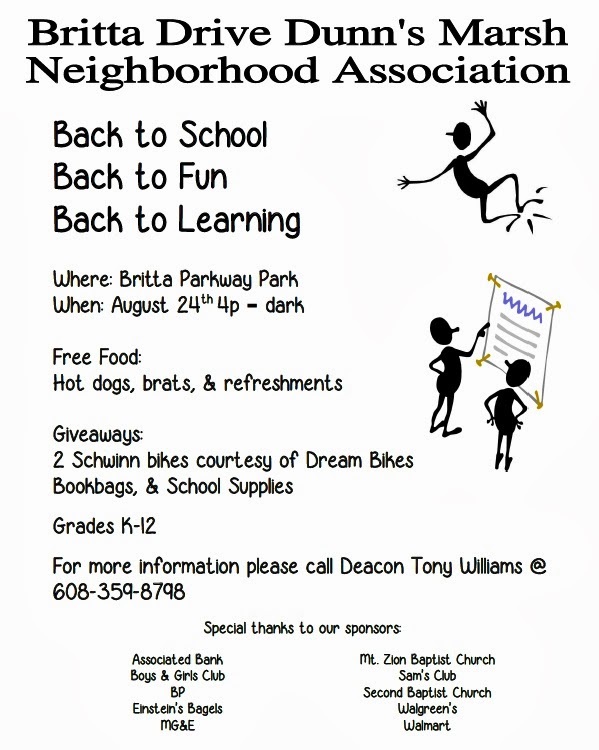 Already the BDDMNA is developing a Neighborhood Watch, and on Saturday, August 24 it will hold a backpack giveaway on the parkway of Britta Drive/Britta Parkway. Read more about that in articles #2 and #3. Deacon Tony Williams, an organizer of the event backpack giveaway and president of the Britta Drive Dunn’s Marsh Neighborhood Association, came to the Dunn’s Marsh Neighborhood picnic early in August along with his wife Denise, to make contact with the Dunn’s Marsh Neighborhood Association (DMNA). “We’re all in this together,” he said, speaking of the neighborhood. Deacon Tony has lived on Britta Drive for 10 years. Other officers of the BDDMNA are Second Baptist Minister Daniel Davis, Vice President; Ms. Niicole Simpson, Secretary: and Scott Fleming, Treasurer. Speaking of the Neighborhood Watch, Deacon Tony mentioned that it would definitely include Britta Drive and could possibly extend all along Lumley Drive as well. Participants will need to attend a training that will be held on September 7 on the East side of Madison. 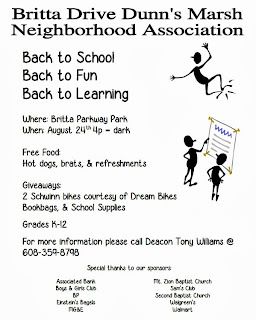 For more information on the BDDMNA, the Neighborhood Watch, or the Back to School, Back to Fun, Back to Learning event on August 24, contact Deacon Tony Williams, 608-359-8798, or by e-mail at <adwilliams043@gmail.com>. 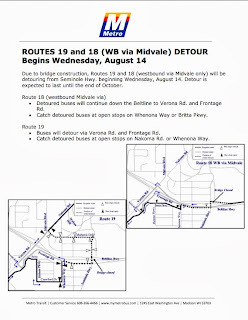 Starting Sunday, August 25, improvements have been made to Route 18 <http://www.cityofmadison.com/metro/schedules/Route18/index-aug.cfm> to help keep the schedule on time. After hearing customer comments at a public hearing in April, it was decided that service would NOT be removed from Crescent Rd. and Red Arrow Trl. Instead, trips have been scheduled every 40 minutes between the West Transfer Point and South Transfer Point between 4 PM and 6 PM. This compares to trips leaving every 30 minutes. This schedule also involves 1 LESS trip in both directions between 4 PM and 6 PM. As a result of this change, customers will not be able to make all* transfers at transfer points between 4 PM and 6 PM. The Seminole Highway bridge is closed to all traffic, including pedestrians and bicyclists, as of Wednesday, August 14 until November 2013. Motorists are required to use alternate routes. Pedestrians and bicyclists should use the pedestrian overpass near Whenona Drive to cross the Beltline. Ramps at the interchange will remain open to provide access to area businesses and neighborhoods. That’s the bad news. Remember, don’t drive east on the Beltline and expect to be able to get off at Seminole Highway and come into the neighborhood. The bridge is OUT! The good news is that the Beltline frontage road between Seminole Highway and Todd Drive is now open in both directions. Now we all have to remember to get off at Todd Drive and come up the frontage road to get on the southbound Seminole or anywhere else along the frontage road. Fortunately, signs on the Beltline remind drivers to use Todd Drive. More bad news is that the contractor took out about 200 feet of the new ped/bike path along the Arboretum on that same frontage road mentioned in the previous article. Paul Watry, Verona Road Project Supervisor from the Bloom Companies, said that the plans for the project required first that a longer path be built, and then required the easternmost section to be taken out. But there’s good news too, related to bike/ped facilities along the Beltline frontage road. The City of Madison is looking into extending that same off-road path to the end of the Arboretum, then onward to Grandview Boulevard which is the first entrance to Arbor Hills, and eventually all the way east to meet the Cannonball path where it crosses the Beltline near Kayser Ford and Culver’s. 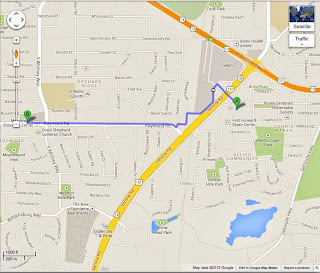 Recreational bicyclists could then do a complete loop to our neighborhood because the Cannonball also foots the Arboretum’s southern boundary and eventually crosses Seminole Highway. Keep going west and there’s a hook up with the Capital City Trail, the Southwest Commuter Trail, and the Badger State Trail. Bad news is that the cost is not in the 2014 budget. The frontage road is higher than the Arboretum, requiring expensive retaining walls. City of Madison Engineer Tony Fernandez notes that political support will be needed to bring this bike path to fruition. Going further east is just as problematical because further on, a steep hill rises to the south of the frontage road, requiring both excavation and retaining walls. The DMNA is working on developing political support now and will be contacting our Madison Alder Maurice Cheeks and Alder John Strasser who represents the Arbor Hills area. We will also be contacting the Arbor Hills Neighborhood Association. More good news is that WisDOT and the City of Madison are working together to get an off-road sidewalk from Seminole Highway west to the ped/bike bridge at Whenona. Now the sidewal is spotty between Seminole and Danbury. It is nonexistent between Danbury and Whenona. At least grades aren’t an issue in these blocks. Hopefully, those Internet links will work. If they don’t, feel free to drop into the project on-site headquarters at the Mid-Wisconsin Security building, the only building left in the block between Whenona Drive and Niemann Place on the Beltline Frontage Road. The lead on-site supervisor, Paul Watry of Bloom Companies - the general contractor - will be able to answer your questions. He’s also available at 277-0878. Others who are knowledgeable about the project are WisDOT’s Mark Vesperman (246-7548), Wayne Chase (246-3859) and Strand Associates’ Joe Bunker (251-4843). Have you been wondering how to get in and out of the neighborhood without blowing a gasket because when there’s a horrible traffic back-up on Verona Road? There’s an easy answer, and it only requires starting your car on a new habit. In brief, the answer is to totally avoid Verona Road by using the frontage roads and other “back streets” to get around. 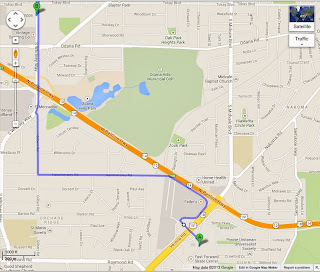 If you are a visual person, view the two maps to see the routes. Those who take directions better through words should read on. Here is an example if you are headed west to the Whitney Way area such as Copps or HyVee or beyond to West Towne. Instead of getting onto Verona Road, simply cross over as if you are going to Home Depot. Turn right to get on the Verona Frontage Road which curves around and becomes Hammersley Road as it turns west. Go a few blocks, past Goodwill, SubZero, Pacific Cycles, and residences to the first stop sign at Gilbert Road. Right on Gilbert to Whitney Way. Right on Whitney, go under the Beltline. or right to HyVee and other stores Road. You’ll gloat as you gleefully glide by dozens of vehicles stalled on Verona Road or stopped on the exit trying to get onto Verona Road. 1. Cross Verona Road and turn left as if going to U-Haul. 2. Continue on the south on the west side Verona Frontage Road and cross the Southwest Commuter Bike Trail. 3. Left and then right on Freeport Rd. 4. Left on Reetz Rd. 5. Right on Raymond Road. Again, happily the traffic won’t be where you are. 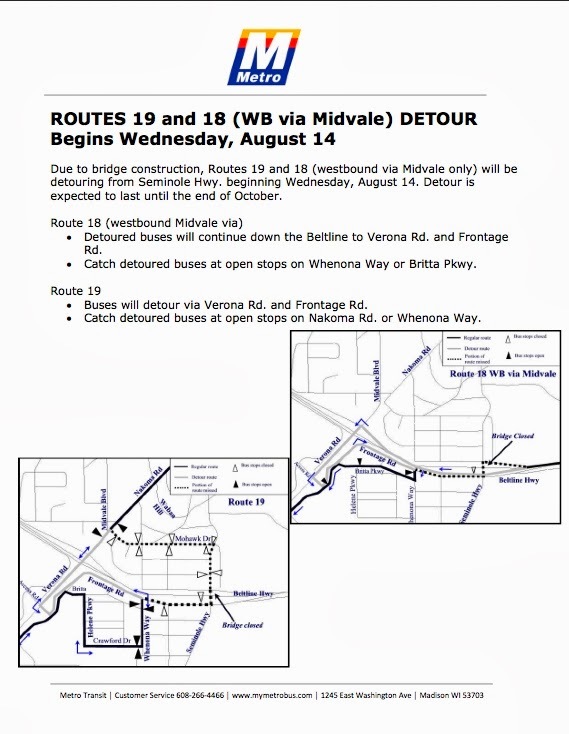 Due to Seminole Highway bridge construction, Routes 19 and 18 (westbound via Midvale only) have begun detouring from Seminole Highway as of Wednesday, August 14. The detour is expected to last until the end of October. 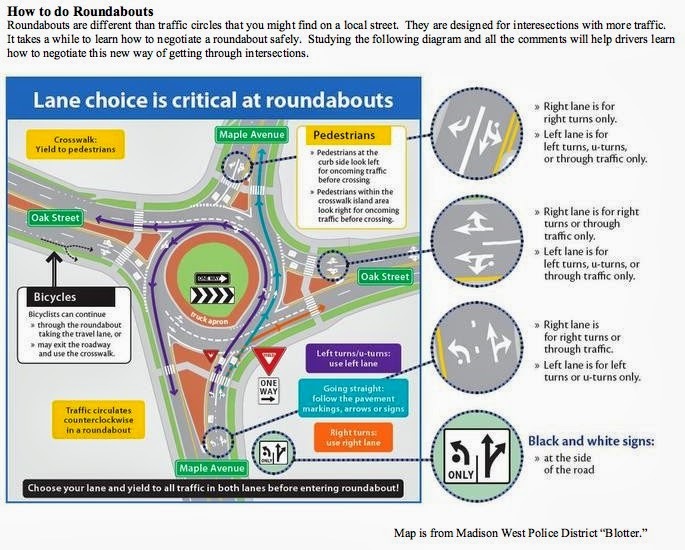 Look at the attachment or go to <https://www.cityofmadison.com/metro/detours/seminolebridge.cfm#one <file://localhost/metro/detours/seminolebridge.cfm#one> > for a clearer picture of the detours. On the map, detours are shown with gray lines with small blue arrows pointing to the changed route. · The eastbound Bus 18 will stay on its usual route. 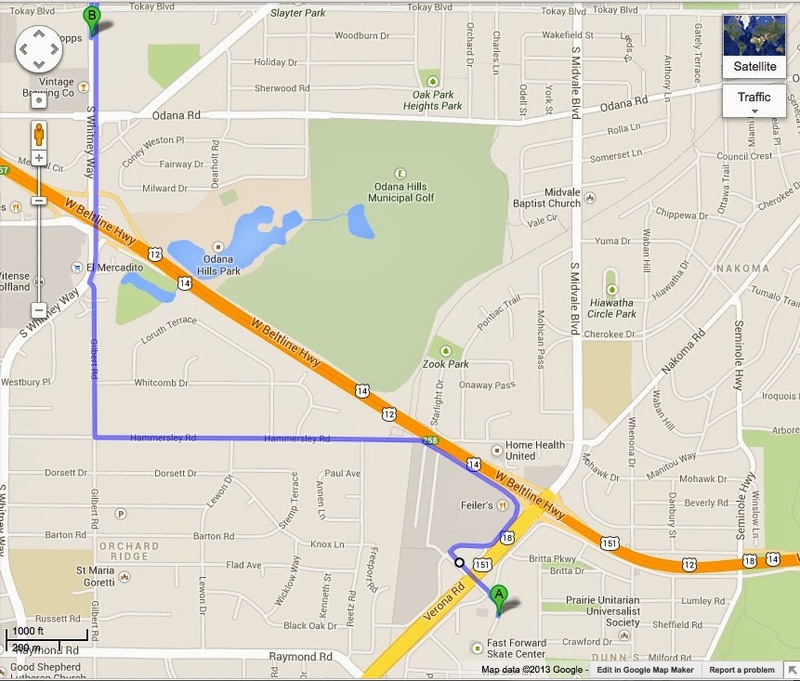 · Buses will detour via Verona Road and Frontage Road. The easternmost stop will be on Whenona Drive, and the bus will not touch any part of Seminole Highway or Mohawk Drive. · Catch detoured buses at open stops on Nakoma Road or Whenonaa Drive. Article 15c refers readers to sources for the latest plans for road and lane closings related to the huge Verona Road Project. But those updates sometimes don’t answer some common questions people may have about the scheduling of some major aspects of the project. A few weeks ago, resident Kim Zinski was concerned about the pedestrian overpass of the Beltline at Whenona Drive. Her qestion to WisDOT was: I have been unable to find a projected schedule for the removal of the pedestrian bridge north of Whenona Way and the closure of the Seminole Bridge. What is the anticipated timeline for those events? Why was she was concerned? Simultaneous closure of those bridges would severely impact access pedestrian travelers, including that of students who cross the Beltline to get to school, as students have to do who live in this neighborhood. In the event that the pedestrian bridge will be closed during the academic year, what are your plans to assure a safe crossing of the Beltline for the children? Well, most of us know that the Seminole bridge closed as of August 14 and will open again in November. But what about the pedestrian bridge located at Whenona Drive? Lead Onsite Verona Road Project Supervisor Paul Watry says that ped/bike bridge won’t come down and be reconstructed until 2015 or 2016, but he doesn’t know what time of year that will happen. Biker or not, there’s a lot to learn about just how bike-friendly Madison is. Traffic complaints continue to be one of the top concerns of residents living in the West Police District. With seemingly more traffic volume every week, the complaints we receive from citizens continue to increase. Big changes are happening to the neighborhood because of the Verona Road project. Every day something looks different. I saw you up taking pictures of the “fallen pine trees” on the frontage road and I hope that you never have the chance to take one of the big old cottonwood that has stood there since I was a little girl. Back then, Verona Rd. was just a “little Ole Two Lane Road.” The house on Daisy that we use to own, sat over there, as did the University Farm. Blizzard’s Grocery Store was about in the area that Ginos now sits. Wow, there have been a lot of changes and more to come. Choosing the proper lane and keeping your speed down will help you avoid problems when travelling through roundabouts. Go to the attachment to see a helpful graphic to study. At the meetings and hearings on the Verona Road project, neighborhood residents worried about how the Beltline was going to accommodate all the traffic from the improved Verona Road. Some people spoke of their fear that the Wisconsin Department of Transportation was aiming toward a Chicago-like system of freeways featuring 8 lanes, 12 lanes or 16 lanes of traffic. “When you pour more and more cars onto the Beltline, what choice will there be but to tear down homes and businesses as the artery is widened again and again?” they asked. Generally, these questions and fears were pooh-poohed. 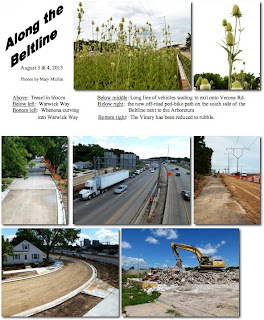 Then back in mid-June, I learned that a new Beltline Study is being initiated by the Wisconsin Department of Transportation. Whoops! The Beltline Study is being led by Joan Peterson and Tom Lynch of WisDOT. They weere collecting data at the time I talked to Joe Bunker of Strand Associates, WisDOT’s consultant on the Verona Road project. More recently I talked to Larry Barta of WisDOT about the Study. A South Beltline is what a number of Dunn’s Marsh residents suggested in the go-around about Verona Road during the past few years. But in the past, the environmentally-minded Town of Dunn has put the kibosh on that idea. Residents in our neighborhood have said we’ve suffered enough from problems caused by the overburdened Verona Road and the Beltline, and a widened Beltline would put even more bad consequences on us and every neighborhood along the current corridor. Some people are saying it’s just too much. A South Beltline Policy Advisory Committee (PAC) made up of elected representatives was scheduled to meet in July, and the Madison City Council got a presentation on August 6. Fitchburg Alder and Co. Sup. Dorothy Krause and Co. Sup. John Strasser who represents areas further east on the Beltline are two members of the PAC. Public information meetings (PIMs) are scheduled for September at 5 different locations. That’s where ordinary people come into the picture. Two PIM locations are quite near us. All PIMs will be identical. 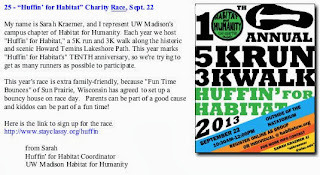 · Tues., Sept. 10, Monona Community Center, same times as above. 26 - There is no #26. Tuesday’s Tunes – every Tuesday from 11:15 – 11:45 a.m. through the end of August, is provided by local musicians at the Fitchburg Senior Center. One of them might be YOU! We welcome kids and adults who want to offer musical entertainment for a very easy-going audience at the Fitchburg Senior Center, Lacy Road. If interested, contact Jill McHone at 270-4291. We do have an organ/piano if needed. Drop off your non-perishable food items, as well as personal essential items (toilet paper, deodorant, toothpaste, etc.) at the Fitchburg Senior Center anytime Monday through Friday, 8:00 a.m. – 4:00 p.m.
We donate food items to the Verona Area food pantry as well as the Allied Drive food pantry. Essentials items are donated to the Personal Essentials food pantry at Arbor Covenant Church. This is the information on a flyer sent to the DMNA recently by Vanessa Martinez, Administrative Receptionst for the Clerk’s Department at the City of Fitchburg. The DMNA was also invited to keep Martinez informed of upcoming events we would like included on Fitchburg’s social media pages. We have forwarded information on the August 22 mosaic design meeting that will be at Prairie UU Society and the August 24 backpack/school supplies giveaway planned by another neighborhood group at the park at Britta Drive/Parkway. Those events are detailed in other articles in this e-News. Seniors can often get discounts at restaurants, retail & apparel stores, grocery stores, for travel, activites and entertainment, and even for cell phone service. The list of businesses is extensive, but often the discount isn’t advertised. Seniors just need to ask. Subway: 10% off (60+) Note, try the new Subway just across Verona Rd. from our neighborhood. For a grocery store discount, try Hy-Vee: 5% off one day a week (date varies by location). Want to know about travel discounts? Drop the e-News editor a request to send the list. Learn the latest about resources for seniors to keep you up to date and safe in your environment. Attend the Crime Prevention and Safety Workshops event on September 20. Workshops will focus on emergency preparedness, introduction to social media, firearms, concealment and current laws, falls prevention, suicide prevention/mental health awareness, personal safety, financial exploitation, mail fraud, safe driving/traffic laws, self-defense tips,bullying in senior housing, scams and frauds. Come and learn how to keep you, your family, friends and clients safe in the home and community. All ages are invited. Cost is $20.00 ($17.00 Early Bird) (Limited Scholarships available) (Continuing Education Hours) The fee includes continental breakfast, lunch and materials. Seniors, law enforcement, city/county officials, human service professionals and the general public are invited to attend. Call RSVP-441-7987 for more information. Meet the native plant gardening experts, get your questions answered, and network with fellow gardeners. Those are some of the many things you can do at the Arboretum Native Gardening Conference on Sunday, September 15, 8:45 a.m. - 4:30 p.m.
Don't miss this day-long conference for beginners and experienced gardeners featuring workshops, a garden tour, and a keynote talk by Rich Henderson, prairie and savanna expert. This is a great opportunity to learn about native seeds and trees, woodland gardens and wildlife habitat, how to design/maintain native gardens with healthy lawns and how to foster native pollinators in your garden. I just harvested a chunk of my garlic this morning and planted fall carrots. They need to be kept moist until germination, but after that they are pretty low maintenance. Sometimes I keep my carrots in my garden until right before the first snowfall and harvest them bit by bit as I need them. So far, 2013 is shaping up as a much wetter year than 2012, and lawns are loving the rain. As residents are mowing their lawns, grass clippings are ending up in the streets so that many municipalities are having to enforce their ordinances to clean up those clippings and prevent further yard waste in the street gutters. Most cities and villages in the region have ordinances prohibiting yard waste in the street since the nutrients from the grass clippings or leaves can make its way to the nearest lake or stream with the next rain. The link between grass clippings and green lakes and rivers may not be obvious. Most people understand the damage that petroleum products and other chemicals can cause in our waters. But grass is just a natural thing, right? Natural things like grass, leaves and mulch are rich in phosphorous—the same stuff that used to be in lawn fertilizer. When left in the street gutter, it gets washed into the storm drains and eventually the river, decomposing along the way and adding that phosphorous directly into the water. Like a chemical fertilizer, the phosphorous promotes plant growth, which typically means algae growth in the water. Consider this—a pound of grass clippings left in the street can result in a pound of algae growth in the river. Algae are natural, but fertilized algal blooms hurt our waterways. Besides the “yuck” factor that turns people away, algae uses up oxygen in the water as it decays, which can kill off fish and other wildlife. Algal blooms can also produce toxins harmful to people or pets. Grass clippings in the street can be expensive, too. Before they reach our waters, those clippings can clog storm drains, increasing maintenance costs and causing flooding. And when they cause algal blooms and fish kills, cleanup costs increase. We can all help! Just blow clippings away from pavement as you mow, and then come back with a broom or blower at the end to push back the escapees. That’s all there is to it. You can either bag the clippings for compost, or mulch them into the lawn to return nutrients to the soil that will help your grass grow. See http://www.myfairlakes.com for more lawn care tips that promote the health of your lawn, the Yahara chain of lakes, Yahara River and, ultimately, the Rock River. The Madison Area Municipal Storm Water Partnership is working with the Rock River Stormwater Group to reduce the amount of pollution making its way to our lakes and streams. The Yahara chain of lakes and the Yahara River both ultimately drain to the Rock River. Both groups thank you for helping to Renew the Rock by reducing stormwater pollution throughout the Rock River area. Learn more at http://www.myfairlakes.com and http://www.cleanwatersbrightfuture.org. 2. Fitchburg Small-Scale Agriculture and Community Gardens Workshop - August 22, 9am for landowners, 10:30am for agricultural growers, Fitchburg Public Library Conf. Rooms A & B – Do you own agricultural land in Fitchburg? Do you want to learn about ways to make additional income ($$$) from your land? Or, Are you interested in growing fruits and vegetables to sell locally or for your own consumption? And, Are you looking for land in which to grow them? This workshop will provide landowners and small-scale agricultural growers to meet and networks with each other. Please RSVP to wade.thompson@fitchburgwi.gov or 270-4258 . 3. Presentation on Farming and Your Food in a Changing Climate: How Climate Change Will Affect What You Eat, Where It Comes From, and How It’s Grown – by Scott Laeser, Aldo Leopold Nature Center educator and local farmer, August 24, 12:00pm at the Aldo Leopold Nature Center Orientation Theater , 330 Femrite Drive, Monona, WI - ... Read More <http://www.city.fitchburg.wi.us/documents/GreenE-NewsBlast29.pdf <http://www.city.fitchburg.wi.us/documents/GreenE-NewsBlast29.pdf> > … Scott Laeser, Aldo Leopold Nature Center climate educator and local farmer, will share how warmer, more extreme weather will impact agriculture in Wisconsin and throughout the US, affect water availability, alter growing seasons, and present more challenges to farmers, changing the food we eat and where and how it's grown. 4. Arboretum Walking Tour, Prairies and Savannas on the Grady Tract, UW-Madison Arboretum – September 1, 1pm-2:30pm - Now is a good time to see the contrast between the sandy, dry West Knoll and wet-mesic Greene Prairie. Meet in the Grady Tract parking lot located at the southeast corner of the Beltline and Seminole Hwy intersection. 7. Leave No Trace – Enjoying the Outdoors Responsibly – September 12, 6:30pm, Fitchburg Public Library, Upstairs Meeting Room - Join the Leave No Trace Traveling Trainers for an interactive presentation and discussion that will focus on the elements of the Leave No Trace minimum impact program. This session will highlight the Leave No Trace outdoor skills and ethics program, which is applicable to all outdoor enthusiasts and all environments. ... Read More <http://www.city.fitchburg.wi.us/documents/GreenE-NewsBlast30.pdf <http://www.city.fitchburg.wi.us/documents/GreenE-NewsBlast30.pdf> > … For more information contact Erin Saylor at 608-729-1763 or erin.saylor@fitchburgwi.gov. 8. Changes at Fitchburg’s Recycling Center Drop Off Site – Fitchburg and Pellitteri staff have noticed increased illegal dumping in the past couple months and are asking for help from residents to report any illegal dumping witnessed along with date/time and license plate info on vehicles used ... Read More <http://www.city.fitchburg.wi.us/documents/GreenE-NewsBlast30.pdf <http://www.city.fitchburg.wi.us/documents/GreenE-NewsBlast30.pdf> > … City staff is currently investigating the idea of converting the 9 “All-In-One” Recycling dumpsters to 6 “Cardboard Only” dumpsters to reduce the amount of contamination. ... Read More <http://www.city.fitchburg.wi.us/documents/GreenE-NewsBlast30.pdf <http://www.city.fitchburg.wi.us/documents/GreenE-NewsBlast30.pdf> > … If you’d like to provide input into changes at the Recycling Drop Off Site, please contact rick.eilertson@fitchburgwi.gov. To report illegal dumping, please contact publicworks@fitchburgwi.gov or 270-4260. A Dane County resolution urging divestment from fossil fuel producers will be considered at the (NACO) annual meeting the weekend of July 20. On June 6, the Dane County Board approved Resolution 43 which addresses concerns over the link between climate change and continued dependence on fossil fuel production and use. Madison constituents, including members of 350.org - which is urging Congress and the President to confront global climate change aggressively - raised the issue with Dane County Board members. The local resolution was authored by Sup. Kyle Richmond, who will argue for its passage at the NACO meeting in Fort Worth, Texas. It then declares that “it is the policy of Dane County not to invest in fossil fuel companies,” and asks that local governments, the University of Wisconsin, the State of Wisconsin, and the State of Wisconsin Investment Board divest their own holdings from fossil fuel companies. The NACO version of the resolution was to be considered by NACO’s Environment, Energy & Land Use Steering Committee in June, and, if approved, would become part of the association’s federal legislative agenda. June 1: Sup. Kyle Richmond attended the summer breakfast for the Pontiac Trail Area of Summit Woods Neighborhood with Janet Daniel, neighborhood watch facilitator; Jocelyn Riley, SWNA president; and Madison Alder Maurice Cheeks. Update on County “Clean Sweep” Site. Dane County residents can now drop off their hazardous waste items and electronics directly at the new Clean Sweep facility, without waiting in line to pay at the landfill scales. In addition, new signage and lane markings are being installed at the Dane County Landfill, 7102 U.S. Hwys. 12 & 18 (across from Yahara Hills Golf Course) to make the Clean Sweep office easier to locate. While the $10 fee for drop-off is still in effect (it costs the County $500,000 annually to run the program), County staff is trying to make the newly year-round facility more customer-friendly. You can contact the Clean Sweep office at 243-0368 or see www.danecountycleansweep.com. Recently, I received communications from both Wisconsin Lakes organization and the River Alliance of Wisconsin. The notifications urged people who are interested in preserving wetlands, lakes, and rivers of Wisconsin to speak out at public hearings or by writing to the DNR to defend the current rules. Back in the 1970s when the Dunn’s Marsh Neighborhood Association was trying to preserve buffer areas to Dunn’s Marsh, we would have been happy to have these rules. But now since Fitchburg is a city, the state’s zoning ordinance and any weakened state rules would not apply to Dunn’s Marsh. For this reason, the DMNA Council declined to take a position on the proposed Shoreland Zoning changes and instead directed me to write an article. Here’s some information about the Shoreland Zoning Rules and the losening of standards and rules related to them from the water organizations mentioned earlier. Shoreland zoning rules set minimum standards for how land is developed around lakes, flowages and rivers. The rules attempt to minimize dirt, salt and other pollution entering the water. In 2009 after seven years and countless hours of research, debate and negotiation and over 50,000 public comments, the DNR updated the shoreland zoning rules. As a stakeholder at the table through this process, the River Alliance believes the current rules, while imperfect, balance flexibility for landowners with long-term protection of water quality of the state's lakes and rivers. Wisconsin DNR is proposing changes to the rules that will reverse many of these carefully crafted standards. While some changes are in response to challenges that counties face in implementing the rules, others are flat out rollbacks to water protection. The changes include allowing waterfront property owners to pave over and build beyond the maximum surface area as long as they promise to treat the storm water onsite. The rule is silent on how counties will ensure that treatment is appropriate, properly installed and maintained. · Shrink the areas around the state where shoreland zoning standards would apply. · Create a new artificial category of "developed land" that would allow up to 40% of a residential lot and up to 60% of an industrial, commercial or business lot to be paved over within 300 feet of the water. · Allow a waterfront property owner to pave over more of their lot than the new standards would allow, as long as they promise to put treat the resulting runoff -- but DNR proposes no process to ensure that the treatment is built and maintained properly. · Allow existing structures built within 75 feet of the water before rules were in place to be expanded, a blatant reversal of previous standards. · Taken together, these changes will allow more development on more properties in more areas with less oversight. It doesn't make sense to undo what took years to resolve and it is patently unfair to citizens of the state to weaken rules that inconvenience a few while the rest of us get to deal with lakes and rivers choked with sediment, algae and pollution. OPPOSED to most of these rule changes. Wisconsin Lakes and other stakeholders spent a considerable amount of time and effort to arrive in 2010 at a comprehensive negotiated package of reforms to Wisconsin's shoreland zoning code, NR115. Since 2010, delays have reapeatedly pushed back the deadline for full implementation of the negotiated reforms. Now the state is working to double back and make changes to the negotiated package, with little evidence that they would not be workable in the real world. The 2010 rules should be fully implemented and administered by the counties for a period of time before Wisconsin considers any new revisions. Wisconsin Lakes objects to most of the specific rule changes proposed here as well. A detailed position statement on these specific changes is being prepared, and will be posted here when ready. It was a long one this time. Thanks for reading.